You are viewing a Commercial Paper Cutter Machine. 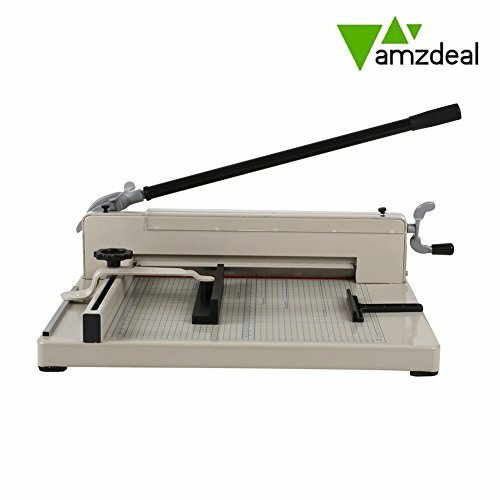 This all steel, heavy-duty and convenient Paper Cutter Machine is perfect for cutting any size under A3 paper, thick books, menu, magazines, etc. It can cut 400 sheets of paper each time, which is very time-saving to cut thousands of papers books. * Base Size: 25 1/2" x 19 1/4" x 2"
* Maximum Cutting Width: 17"
Perfect machine for cutting sizes equivalent or under A3 paper, thick books, menu, magazines & etc.